Roda is an old fishing village and a small family beach resort, it is mostly used by the British package tour operators. There is a super 'cove' type sandy beach. The original town has developed, but you will still find locals continuing their everyday life. Families looking for a quiet package holiday will love it. There is the possiblity to rent sunbeds at the beach of Roda. None - plans are for toilets and showers though. The beach looks child friendly and is very flat. The road above the beach though is close and although it is not too busy you would need you to keep an eye on young children! The nearby rocks would keep the slightly older ones amused. Down a few steps from the road. There is plenty of parking at the top, close to the beach. No Urchins, and the beach is cleaned daily of seaweed. I was disappointed though to find cigarette ends on the beach. Acharavi has the hydro polis water park - which is a short journey away. 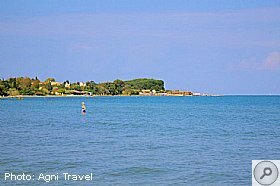 It is also possible to visit the two islands just off Sidari - Arakosa and Mathraki. The smart looking 'Roda Beach Resort" is to the West at the end of the beach. Sidari is beyond that. Acharavi is to the East. Both Acharavi and Sidari, would be too far to walk to. Near to the beach is the ruin of an ancient Greek temple. At a large set of crossroads, turn right and you will enter Roda. The road system is a little strange - it is a triangular shaped one-way. Drive straight ahead for the beach. The old part of the village is on your right. The bus stop is close to the Roda Beach. There are a lot of good tavernas and restaurants in Roda. A regular BBQ trip is also arranged to one of the nearby islands. There are many bars in Roda. Some near the beach front, and the others in the old part of the village. Roda is not a water sport resort, but there is the possibility for an active day. The closest water sport resort is Sidari. Spiro's "Voyager" Boats. Spiro offers motors boats from 15-25hp. He rents them by the hour and the price includes petrol. No license is needed. For safety, you are given a mobile phone. With the boats, you can go as far as Perulathes to the West and Kassiopi to the East. There are many gift shops and jewelry shops in Roda. There are several cash machines in Roda. Also many places cash traveller's cheques or exchange money. There are several public phones in Roda as well as post boxes. Three or four. Entrance free, but you are expected to buy a drink or snack. Excellent Horse riding and go carting. None to speak of, but the whole resort is flat. there are though a couple of steps down to the beach. This page focused on: Roda Corfu. 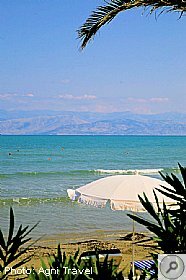 For related information, please visit our Corfu Resorts Guide page. Hi folks, going to Roda on Thursday and was wondering if there is anything new happening in the village, also is the exchange rate any better over there? Hi, Does anyone have any contacts for studio accommodation for a 2 night stay in Kassiopi. We are staying in Roda in June but want to come to Kassiopi for 2 nights. It's A.Maaaaazing! I used it for the first time last year in Roda, Corfu and although it rained every single morning so there was lots of standing water, I didn't get a single bite. Paxos will be the great test, I think the mossie's are more prevalent there. Although the cream seems thick when you squeeze it out, as H says, it disappears into your skin better than some fancy body lotions! And doesn't smell unpleasant either. I got my first tube from Amazon, it's really quite cheap compared to Jungle Formula or Autan and lasts well. We got home in the early hours of this morning after a week of bliss. Thoroughly enjoyed a week off real life. No TV, no newspapers and only on the inernet twice - to check arrangements for meeting up with resident friends and to check for any changes to our return flight. Nikos-Cassiopeia was very comfortable and a great base for our holiday. We had advised that we would be arriving in the early hours and they advised us of the access arrangements. We walked in to find ourselves in a spacious, two bedroomed apartment rather than the studio we had booked. When we met our hosts on Saturday afternoon we asked whether we were in the right unit and Natasha responded that, as they were not full, they thought we would benefit from the full kitchen facilities of the larger apartment. It was good to have a full size fridge freezer & cooker. Somewhat to my surprise, I didn't miss having a sea view. About two thirds of Kassiopi was open at the beginning of our stay and more eateries, bars & shops opened during our week. Almost everywhere is open from today. When we were in Kassiopi during the day we lunched at Virginia's enjoying the food, wine and view. We also had an early dinner there last night before leaving for the airport - tried their delicious burgers for the first time. We dined at Melina Bay three times - different style and price point to Virginia's but we find at both venues the food, wine, staff and view combine into a very positive experience. We tried breakfast at Bolero - good bacon & good coffee. If we had been there for longer than week we would probably have tried an evening meal there - maybe next time. Outside of Kassiopi we had a leisurely Sunday lunch with MCH & Elliemay at Taverna Yialos (off the main road across the North) and a great evening with them at Taverna Bikolis at Peroulades. It was a joy to be there so early in the season with all the plant life in abundance and spring fresh. During a walk round Roda en route to meet our friends for that Sunday lunch we came cross a beautiful rose garden and watched the beach being prepared for the season. The only problem we had with this holiday was that a week just wasn't enough, even though it was our 17th visit to Corfu. There are some good walks from Acharavi. By the sea you can walk to Roda in one direction and Almyros the other way. There are also walks up into the hills, lovely wild flowers in May. The bus to Kassiopi is seasonal as Elliemay said, it runs from Kassiopi to Sidari and back,calling at Acharavi and Roda. If the singing group are called the Jersey Tones, saw them twice in Roda and they were brilliant. Does anyone know which night of the week the Roda Park Greek night is on please? Hi All, going to Roda on 6th July, wondering which shops sell cigarettes and what the current prices are per pack/sleeve? I've not been onto the forum for a while, hence such a late reply. My partner & I are also staying at Valentino's in September. We visited Roda last year for a couple of nights before heading over to Paxos. We stayed at The Coral Hotel which, as I can gather, is a stones through from Valentino's. We only had two full evenings there (having arrived very late on our first night) the things we enjoyed were the Hotels own bar and restaurant, open to the public. Nino's on the beach pool & bar, The Boathouse bar and a few others whose name I've forgotten. Roda's not huge so I think you'll find it easy to try out a lot of places. Hi folks arriving in Roda shortly, any major changes, new restaurants or bars. We're going to Roda on Monday 23rd May. πππ Just wanted to know what the exchange rate is at the moment over there. The Kosmas apartments is situated on the main road and about a 10 minute walk into the village, Roda is flat as you may know, at the apartments there are two brothers George who is there most days and Christos who is mainly there in the evening, their English is very good. Poppi the mother seems to do everything around the place from watering the plants to helping Christiana your cleaner. If you need anything then please ask, her English is not good but neither is my Greek but I get by. There is also Effie who is Georges daughter who also works at the reception sometimes. Themis the father of the brothers also does all sorts around the place and cooks when it's BBQ night. All the family are great, very helpful and friendly. Across the road there is a supermarket run by Spiro and Lisa they stay open until very late they also speak English. I'm sure you will have a fabulous time at the Kosmas as we have for the past 9 years. The only thing I know about Sams boats is as Alankeith writes above, I have never used them. I hope this helps and Yammas for now, John. Sams boat hire are based in Roda and can hire by the hour, best to go mid morning as the sea can get choppy some afternoons and he won't hire boat if its rough. Normally pay for however many hours you require and pay for the fuel used on your return. 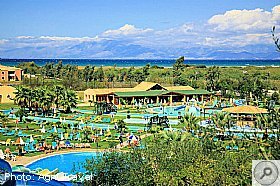 Coming to Roda for a weeks stay beginning of June - staying Kosmas apartments. Any info welcome regarding these apartments and can anyone recommend boat hire nearby? Topic: Gym In Or Near Kassiopi? Thanks Davyboy, we have hire cars so I think he would prefer gym at Roda. We thought there may be one at Achravi or Roda so not too far away. We will try and find it for him, thanks again. View Topic: Gym In Or Near Kassiopi? I know some friends of mine who live in Kassiopi, go to Spartans fitness Center in Roda. 10/15 minutes bus ride away. There's also a place down the lane from Mak Mak bar where they go for Martial Arts. Rather a leaden sky over Roda today. The cloud formations look rather like snowy mountains in the distance. The see is a lot calmer in Roda today. I was pleased to see all the Palm trees are still standing and Ihope that they have not been affected by the ravages of the Palm Beetle. Not much information from Roda of late so I thought you might a view of sea conditions. Hi everyone, I am spending two weeks in Roda at beginning of September. I will be staying at Valentinos with a garden view. What would be your recommendations for tavernas as well as bars. I am travelling alone but not a shy retiring type. Like everything Greek but tend to avoid karaoke bars and similar. Like chatting and meeting new people and this includes locals. Thank you in advance. So, we are back from our two weeks in Kassiopi. What a lovely two weeks it was. We stayed in Sun Rise Apartments this year and would stay there again. They are to the right of the harbour (as you face the sea), behind the Manessi Apartments. Great location, quiet & peaceful but 2 minutes walk to the harbour and everything Kassiopi has to offer. Our apartment was clean, light, airy, well equipped and very comfortable. The balcony afforded a great view of the castle and the harbour. We spent a couple of hours on it each morning enjoying our pain aux raisin and coffee along with the view. Oh those pain aux raisin! I think they call them raisin & custard croissants in the bakery. We ate far too many of them but they were so good. The weather was mostly good. Very hot for our first couple of days, we needed the aircon. Our friends stayed at Melina Bay and were very happy there. One of our friends was visiting Corfu for the first time so we thought he might want to be out & about a lot but he was quite content to sunbathe on Kalamionas beach most days. We visited Kalami, Acharavi, Roda, Sidari, Paleocastritsa and Corfu Town. We had a puncture on the hire car (Value Plus replaced the car) and had a wet boat ride to Corfu Town. We also had two dry boat rides to Corfu Town and went in by car. We used the new car park on the main road near the new port βeasy to get to and 3β¬ for all day. 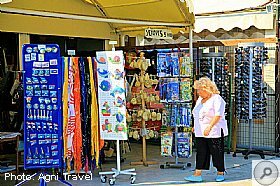 In-between we relaxed and pottered around the Kassiopi shops - some interesting new ones and some revitalised previously existing ones. We had a couple of disappointments β one taverna served me unpeeled king prawns, didnβt provide a fingerbowl until I requested one then the waiter tried to tell me that prawns are always served that way. On the same evening we walked up to a cafΓ© bar we had used on previous visits and were surprised to be informed that they didnβt serve coffee at that time of the evening. Their βwaiterβ went on to tell us, in so many words, that if we didnβt like it we could go elsewhere. We did and we didnβt use either of those establishments for the rest of our holiday. We enjoyed some good food and some great food. Limani has been our favourite lunch spot for a few years now and continues to be so. Harbour Bar was, again, our usual pre-dinner rendezvous. We also had a few post dinner drinks in Virginiaβs. We re-visited & enjoyed Kalami Beach Taverna, Sousouro, Petrino & the restaurant at the Melina Bay (delicious seafood saffron risotto on our last night, with peeled prawns). New eateries we tried this year and would happily re-visit in the future were Uncle Simos in Kassiopi, Alegria in Acharavi, Alipa in Paleocastritsa and Bikolis in Peroulades. Back in 2001, on our first visit to Corfu and staying in Kalami, Porto was the first taverna we ate at in Kassiopi. I had my first tastes of Lamb in Gastra, Bourdheto and Yiouvetsi there and enjoyed them all. We hadnβt been in Porto for several years but noting that it was under new management we decided to try it one night. The Lamb in Gastra was even better than I remembered, my companions enjoyed their meals there too and Porto still has the old photographs of Kassiopi and Corfu Town inside. There are a couple of Corfu Town in 1862. Our first morning back at home was a rude awakening β no balcony, no view, no sunshine and no pain aux raisin! However we are back in Kassiopi for a week next May, following our first cruise. Itβs a few years since we last visited early season so we are looking forward to the lighter evenings and being able to enjoy those views for longer. I assume the contact in Roda was Alex. He will be very busy at this time of year with his bar. However you might be able to make contact via Facebook using the Drunken Sailors page. Thanks Elliemay--have googled all clubs until my google finger hurts but to no avail. I was given a possible cricket aficionado in Roda but e-mails remain unanswered. Will keep trying over winter when perhaps people will have more time. Hi there. I was in Corfu with my Boyfriend and as we were staying in Roda we lost our camera. We were in a play room with some games like billiard or cardriving. So this room was next to the "Drunken Sailor" and vis Γ vis from the Oscar's bar. We were playing there and we let the camera on a little blue airplane for young children. And as we looked to the camera again it was gone. So we know from the security cameras that may a woman and a man with a little child took the camera but may not with bad toughts. So if somebody knows anything about that please contact us. It was the camera I've bought from my very first money I got in my apprenticeship. And so it makes my loss even more worse. I had a really good time with this camera and she took the moments which was the most important to me in my whole last years. So there's not just the value of money. It's more a sentimental thing. And It's because there are some photos on it which my boyfriend and I took for our first real holliday. So if somebody just know a little detail please let us know. We are more than happy if we found the camera and the memory card. Oh and it's a black CANON 600D with a black belt/tie with says "CANON" and inside it is a 64 GB Memory Card. On The Display there's dust inside. 01/08/15 Meeting of traditional dance groups in Kassiopi. 01/08/15 and 02/08/15 Panegyri/Festival Roda/Acharavi. Main road near BP garage. 09/08/15 Varkarola and choir meeting in Kassiopi. Marion and I have stayed there. The villa is up a track/road just before the Imerolia taverna. The track/road is on the left hand side of the main road to Roda etc. The villa is beautiful and I am sure you will enjoy your stay. 11th this month, Megalo Paneghiri in Acharavi. Not sure where it is, either town hall or in the olive grove between Roda and Acharavi, I just saw the signs on the roundabout yesterday. I can highly recommend the international folk dance meeting, either in Corfu Town or Sinies Village above San Stephanos NE. Okay, I'm sure it's scaremongering by the British press (I use the term loosely, this was in the Sun yesterday) anyway there was an article in the paper yesterday claiming that Corfu and Crete are running short of various medications and that hotels only have 10 days or food left. Any one give us any indication how correct this is please? It does sound a bit 'off' to me, however we are coming back to Corfu for the 8th or something time now on Monday and can bring stuff with us if needs be? Roda again. Any thing we need to be aware of to bring that we wouldn't normally? You can still get water,wine and song okay? Topic: Help!! Which Resort To Choose? I would suggest looking at Arillas, Roda, St. George NW (Pagi), San Stephanos NW. All are family orientated and quiet, but you can find busier bars. Sorry but really only know the NW, sure others here can recommend others. Arillas really fits your bill but I am biased as I love it there. View Topic: Help!! Which Resort To Choose? Sorry for doing this so late, Iβve had a Paxos hangover and couldnβt bear to write this up in the past tense until now. This year we booked independently for a number of reasons but the main one being that I wanted to fly out on the 8th of May and have 3 days in Corfu before a week on Paxos, I could not get a package deal for my needs. There has been some tooing & froing on here about package v indie, Iβve come out of it preferring package, personally I found it hard work keeping all of the balls up in the air having made 6 different bookings (Parking, flights, taxi, hotel, ferry, 2nd hotel). It stressed me out far too much and unless necessary I wonβt be doing it again. That said there were no hiccups apart from some small issues with our return flight and a flat car battery, all of the companies we used were helpful and it worked out well considering the potential for things going wrong. We booked our flights with EasyJet from Manchester early on so got a good price, parking with Purple Parking via a Voucher Cloud offer, Taxi to Roda (and the return) with Roda Taxiβs via the Roda Online website, Coral Hotel in Roda via Booking. com, ferry transfer & transfer to Bastas (and back) via Routsis Holidays by email and room only with Olympic via their website. We arrived late at The Coral Hotel, they kept the bar open for us and we enjoyed a nice couple of arrival Mythosβ and cocktails. Our room was on the ground floor and light, bright & clean, the bathroom was a treat!! Very up to date with a fully enclosed shower cubicle, what a Greek treat ο. Breakfast was included, described as continental but it was a bit more than that, had a big fat bowl of Greek yoghurt, honey and (tinned) fruit every morning. Roda is a pleasant village, all on the flat with a wide sandy beach at one end, The Coral is touted as being on the beach, it is but itβs not a useable beach, itβs narrow and rocky but perfectly pretty to look at and walking out of the hotel to such a beautiful view morning or evening is a real treat. Roda has a really nice mixture of traditional and up to date bars & Tavernaβs and as usual everyone is super friendly, there are quite a few Brits working there as well as business owners. We used Ninoβs on The Beach pool & bar during the day as The Coralβs was a bit small, treated myself to an honest to God carved out pineapple cocktail on our first day. Next day we walked up to Acharavi along the sea front then up into the village proper and the old village, got some well-priced βThank you for looking after the catsβ olive wood gifts. On Monday we left after breakfast for the port and our ferry over to Paxos, had a blip whereby the fella in the port wasnβt there to hold/look after cases and the rumour from Olympic rep Sam was that he may not be back for the season at all. Atlantis Hotel happily stored them for us, we made sure we had a drink there before we hopped on the 2:30pm ferry. Ferry trip was dicey, a storm rolled over briefly and I was a bit green around the gills from the sea/sky view towards Corfu, by the time we were driving to the hotel the roads were steaming, great personal service from Routsis and we were at the hotel in a jiffy. Had a 2nd floor room with a garden terrace, due to the time of year it was actually a bit chilly come the evening and we used the blankets all week for the first time ever! We introduced friends to Paxos for the first time and they arrived on a specially laid on Illida Dolphin crossing, theyβd suffered the remnants of the storm on the crossing and were already saying βwe wonβt be coming againβ Iβm really really pleased to report that by the end of the holiday that view had changed and for the first time ever they have said they would return (The only other place theyβve been to twice before is Las Vegas!). I wonβt go into our daily routine as weβre creatures of habit regarding places to eat & drink. Dioβs and La Piazza were not open the whole time we were there, Manadendri taverna & beach did not open for business until the Friday, we went Saturday, we could not get a scooter from Christos. There is a new shop in the square opposite Nionoβs & Pounentes, it sells the same things as the Balinese shop by Harbour Lights, there were no other new businesses that I could see and some of the shops were not open yet. We did have a boat but had some issues with it and had to pull into Mogonissi beach to call in, turns out it had either overheated or munched up some rubbish, it was fine after weβd stopped for a while but weβd been told to be OFF Anti Paxos by 12:30pm so by the time weβd sorted the boat it was too late to go over, but we made the most of it and took our time going back up to Lakka stopping off at Loggos for picnic lunch then ice-cream at one of the bars. We took the bus to Gaios one day, ate at Georges Corner (shock horror) and a taxi one evening just for drinks. For my birthday we breakfasted on bacon sandwiches and prosecco, spent the day at Harimi beach & at Bastas pool, went to ALL of the bars in the evening and ate at Nionioβs, had an absolutely perfect day which could only have been improved if weβd realised Manadendri had opened up that day, weβd have spent the day there instead. As weβd booked indie we could afford the luxury of the later ferry so did have the morning and part of the afternoon to enjoy on Paxos, our friends who booked a package with Olympic were picked up at 6:30am for the first ferry despite their flight not being until 4.30pm. We said a fond farewell to some various people on the island that weβve forged and strengthened friendships with and I did have a lump in my throat for a while there. Our beautiful donkeyless island paradise will be missed by us as itβs unlikely weβll see it again for well over a year, we enjoyed the nature on the island being early season, that we donβt normally see such as the beautiful flowers, fireflies in the evening and more bird song than we usually hear. Paxos does sing a sirens song to us, weβd happily dash our boat against its rocks to be forever caught in its tideβ¦. But we would need to remember our Bleasedale book, which we didnβt do this year. We usually have a car, but the times we do use a bus for nipping up to Roda and Sidari. We find it's never more than 10 minutes late. On the Kassiopi to Sidari and return bus you pay the driver. Gonzo asked about changes in Kassiopi and even since our last visit 3 years ago there have been some. Out of the blue is now a supermarket, the newspaper shop is a clothing 'boutique' and there are several other new ones around the village. Everything appears to be moving more upmarket and prices in a lot of places have gone up, which was not unexpected given the additional taxes under the Greek 'austerity' measures. However Don's new venture 'Taverna Levanda' sells some very good food and is very popular to answer my own question a few posts ago. As for the old 'Mexican' restaurant which went to English before closing, it's currently being redeveloped as an extension to 'Ena' supermarket next door. View Topic: Kassiopi Update Please? Missed my annual holiday to Roda last year due to a wedding in Zante , has there been anything new in Roda in the past year ? Topic: Let The Season Commence! View Topic: Let The Season Commence! Topic: Anyone Ready For Sidari? Hi Moyra, Helens Apartments are right by the main road going into Sidari from Roda, if you know the Merri apartments coming from Roda, just as your heading towards Diellas, its the road on your right about 300 yards before the bridge or about quarter of mile before what was the UK shop. Steep incline Merrii apartments straight away turn left and there down at the end on the right. You cant drive from the beach as its over the wooden bridge past the beach star turn right walk up that road till you nearly hit the main road and its the last track on the right at the Merri apartments and down to the end. I hope you understand my hopeless directions. Dave. View Topic: Anyone Ready For Sidari? Stroll along the seafront into Roda see what takes your fancy. You all know what a nervous ninny I've been over this! I have to say it hasn't been the easiest holiday booking of my life. Thought I'd list a few things for reference if anyone comes looking. Booked our May 2015 flights in November 2014 - I think we got a good price. Booked room only at The Bastas Hotel Lakka through Olympic Holidays website - Ridiculously cheap. Booked all of our transfer (excl airport to port & back) with Routsis Holidays (based in Lakka) via email. We are having a few nights on Corfu first. Booked Coral Hotel in Roda via Booking. com and a taxi transfer with Roda taxi's via the Roda online website/email. Really looking forward to it as expected! I'll add on afterwards how we got on. You can get the bus to Kassiopi and then get the Kassiopi to Sidari bus, stopping at Acharavi, Roda and Sidari and stops in between. Topic: The Forum Is Dying!!! Panic over! Heard from Irene at Routsis, she said it looks like my emails were going into her junk/spam folder. View Topic: The Forum Is Dying!!! Only just arrived but here is what we have seen. Alegria is closing for two weeks from this weekend of Paska. The blue grill is closing for one week from Paska also. The Central Bar is now being operated by our friend Vasili, who used to be up in Ano Perithia, he is also serving food lunch and dinner. At the moment no menu, he just tells you what he has. Contrary to rumours I have heard during the winter, there are no shortages of supplies in the supermarkets, everything just seems to be about the same. Hi looking at trying Kefalonia can anyone please give advice on resorts. We like the North of Corfu Roda, Sidari, Kassiopi. Not sure where to stay. Jenny and I have been going to Corfu since the mid 1980s every year and sometimes twice a year but never venture from Sidari, Roda, and all local places. We have hired a car and want to go to lots of little villages and seaside places North side of Corfu town, anybody got any suggestions of nice beaches, nice restaurants, anywhere really. We are staying in Sidari for 2 weeks from the 1st June. Venus is is well placed for both Roda and Acharavi which can both be reached by a short walk along the sea front. Arriving in Roda on 2nd August and staying at Charlies Venus Apartments, can anyone tell me if these apartments are central to both Roda and Acharavi? Barrie, as far as I know there is only one Panigheri, in Acharavi, and that is later than you asked for, located in the Olives on the way to Roda, quite a big affair. However, last year, there was a dance festival on the 8th June, in the Town hall square with all the usual side shows, food, drink, candy floss and roasted sweet corn. Watch out for festival banners draped round the Pump Roundabout. I am not sure if this has been posted in the past but here is a link to a webcam in Roda. 2. Always first drink of the holiday is at Kalami Bar. 3. Day out in Corfu town with cod and chips at Belissimo. 4. Day out on N.E. coast with refreshment stops in Sidari and Roda. 12/02/15 Tsiknopemti (Smoke Thursday). Traditionally the last day to eat meat before Easter Sunday. 25/03/15 Greek Independence Day/Greek Orthodox Annunciation Celebration. 23/02/15 Katheri Theftera (Clean Monday). First day of Lent with traditional picnics and kite flying. 01/05/15 May Day/Labour Day. Celebration of Spring/Celebration of workers. Panegyris in many villages. 21/05/15 Ascension Festival in Arillas. Tradiitional dancing, food and local beers. 21/05/15 Panegyri/Festival in Nymfes, Loustri, Gimari possibly many more as this is a major celebration. 24/05/15 Panegyri/Festival in Kato Korakiana. Churchyard of St. Helens Church. 31/05/15 Traditional dance display. Acharavi in Town Hall Square. 23/06/15 St. John's Eve (Klidonas) Fire jumping in many villages. 01/07/15 Panegyri/Festivals in Avliotes, Kanoni, Garitsa. 11/07/15 Traditional Greek dancing festival. Pelekas. 11/07/15 Megalo panegyri in Acharavi. 17/07/15 International Folk Dance Meeting. Corfu Town Square. 17/07/15 Festival of Agia Marina (patron Saint of Benitses) in Benitses. 18/07/15 International Folk Dance Meeting. Sinies. 25/07/15 Pie festival in Gimari. 26/07/15 Panegyi/Festival in Vraganiotika, Neochoraki Lafki, Loustres and Velonades. 27/07/15 Panegyri/Festival in Vitalades and Kato Garouna. 01/08/15 Sardine Festival at Pentati. Panegyri/Festial in Moraitika. 01/08/15 and 02/08/15. Antamoma Festival in Arillas. 08/08/15 Varkarola Festival in Paleokastritsa. Celebrates the miracle of St. Spyridon/Odysseus. 10/08/15 Panegyri/Festival in Strongili South. 11/08/15 St. Spyridons day. Procession in Corfu Town. 15/08/15 Festival of the Assumption of the Virgin Mary. Church processions, panegyris in many villages. 17/08/15 Sardine Festival in Benitses. 23/08/15 Corfu Dance Festival in Arillas, held 23-28th August 2015. 26/08/15 Wine festival in Gouvia. 23/08/15 Festival of Virgin Odigitrias in Pentati. 24/09/15 Monastery of St. John, Agios Ioannis, Karousades. Entertainment and games by CREART. 25/09/15 Monastery of St. John, Agios Ioannis, Karousades. Karousades Philharmonic Orchestra. 26/09/15 Monastery of St. John, Agios Ioannis, Karousades. Panegyri/Festival. 10/10/15 Beer festival in Arillas for just one day. CANCELLED. Adverse weather. We will be in Kalami for our annual fix in July but for the first time in 15 years we won't be staying at the A&A (can't bring myself to call it San Antonio); can't bear the thought of parading a coloured plastic band to show full board, half board or bed and breakfast. I am sure that even though they have a loyal client base the new dining options will have an adverse affect on Kalami Beach Taverna, Thomas's and the White House. No matter how the changes affect Kalami we will no doubt enjoy ourselves but it may well be that 2016 will be goodbye Kalami, hello Roda or Kassiopi. We went to Roda last September and were on our way to Kassiopi (walking!) when it started to pour with rain!! So we ended up in the nearest taverna and got a taxi back to the hotel. So we didn't actually get to Kassiopi. We saw it however, on the coach when we were heading to the airport, the sun was out and as we rounded the headland at Imerolia there it was bathed in beautiful September sun. I could have got off the coach and stayed, it was stunning. The beach at Kalamonias? and the headland seemed to glow. Roll on June the 12th, I think our first drink will be in MakMak as we always feel at home in there and the owner is a very nice guy. Then Kostas and onto Illusions and Veronicas. Should do for the first night. Not sure about where to eat yet, probably the Old School House, seems to be tradition. Look at me, I've got it planned already, how sad is that. Just can't wait. Just booked the Mare Blue in St.Spyridon. Were going on May 25th during the half term break for a week. Never been there before weve done Roda, Sidari, Agios Gordis, St Georges south and Kassioppi so not sure what to expect. Whats it like in the village? How far is it from the hotel? What type of tavernas and bars are there? My three kids ages are 5, 7 and 10. Hi everyone, hope someone can give me some advice. I have posted similar on the Corfu forum on TA, but posting here too - hope thats OK. I am planning my honeymoon for end of May/beginning of June this year. We have decided on Corfu and Paxos, with maybe a couple of days in Italy first. 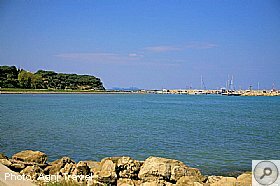 Looking to get to Corfu on 24th May, spend a couple of days in Corfu Town, then come across to Paxos for 5 days, then back over to Corfu and maybe to Roda for last few days. Nothing set in stone yet, apart from flight from Corfu to UK on 4th June. What day of the week is the best to travel, or does this not matter? Is there much in the way of entertainment in the evenings ie live music? Is there anywhere to hire bikes, or is it not suitable for cycling? I will also be looking at recommendations for accommodation. We are not bothered whether it is hotel or apartment or b&b, as long as it is clean and welcoming (tho as it is our honeymoon we dont want anything too basic). We prefer to eat out in the evenings. Sorry about the long post, hope someone can give us some tips. Hi all - have hired a motorboat from Sam's boats in Roda a few times in the hope of spotting some dolphins up in the North but never had any luck yet, was wondering has anyone seen any up there, normally go in June. Hi Davyboy, seems like were exactly on the same page comma and full stop. It's not my imagination either that when I stroll up from Roda to the cafΓ© neon in Sfakera, They keep Alfa beer icy cold, I don't know how !!! but it is compared to other places, Yammas. You might get a starter in the surrounding areas for 16 euros! If you hire a car then you can explore the coast and Ipsos and Barbati (South) will offer good value food, as will Kassiopi, New Perithia, Acharavi and Roda (North). My house is just before the "y" junction that leads to; Roda on the left and the harbour on the right. Turn left up a dirt track just across from the motor bike rentals, it begins with "N" I have a terrible memory these days. You're very welcome. I always have ouzo in stock or Yorkshire tea if you prefer. Do you mean the one that started before daylight on Sunday 5 October and lasted until mid afternoon on Tuesday 7 October? Yes, we got caught in that one. Sunday morning we sat on our apartment balcony hoping it would stop. In the afternoon we drove over to the west thinking it might be better over there. No such luck. Coming back via in inland route we parked up in Acharavi. After a cold, wet walk along the main street we stumbled down a side street into a taverna. Ta Rebetika had a log fire going and we were soon warm & dry. Monday we stayed local in Kassiopi. We called to have a cup of coffee with Joanna at Melina Bay. We then took a wet walk up to the supermarket in the square and the bakery for sustenance. Tuesday we drove over to Paleocastritsa which appeared to be deserted. We then drove up through Lakones and stopped at the Golden Fox because our friend was on her first visit to Corfu and every Corfu visitor should see that view at least once. The view was still worth seeing even in that weather. We came back over Troumpeta and dropped into Roda for a late lunch. Whilst we were en route the rain had stopped and the sky started to clear. By the time we got back to Kassiopi the sky was benign & blue again and stayed that way for the rest of our holiday. We've experienced rain, thunder & lightining on Corfu during previous visits but not relentlessly for almost 3 days. We went out on the 27th September and had a glorious first week. A friend joined us for our 2nd week, her first visit to Corfu. We picked her up from the airport on Sat 4th October and thankfully the weather was still lovely that day. What a change we woke up to on the Sunday morning. No harm done and we were not stuck on a plane during it. It's just difficult finding things to do on a Greek island holiday during prolonged periods of adverse weather. Sunday afternoon we ventured west to see if it was any better over that side but it wasn't. We ended up coming back over Troumpeta (the rain was so solid we couldn't see the quarry!) to Acharavi and having a cold, wet walk along the main street before stumbling into a taverna down a side street. Luckily for us the taverna was Ta Rebetika who had a log fire going, we were soon warm & dry. Monday we stayed local in Kassiopi. Tuesday we drove over to Paleocastritsa which appeared to be deserted, never seen empty beaches there before. We then drove up through Lakones and stopped at the Golden Fox because every Corfu visitor should see that view at least once. The view was still worth seeing even in that appalling weather although the price of cake & coffee for 3 people was not conducive to repeat visits. We went back over Troumpeta again and dropped into Roda for a late lunch. Whilst we were en route the rain had stopped and the sky started to clear. By the time we got back to Kassiopi the sky was blue again and we booked the boat trip to Corfu town for the day after. I'm not sure our friend will be back but we will be. Next year we'll pack our tablet, just in case! RODA there will be at least two grills rooms open, (very cheap) a couple of tavernas (at least) and a few bars for snacks. There will also be mini markets open. Acharavi is a short walk along the seafront and is 'open' all year round where you will be able to access anything you are likely you need. Arillas is a definite, also Roda and Acharavi are quite flat too. After 4 consecutive visits to Kassiopi until 2012, it was decided that we should at least try some other places to visit (just in case there was anywhere as good). So we tried Majorca, very nice but inevitably we compared it to Kassiopi. So we tried Zante, very hot but we inevitably compared it to Kassiopi. So we tried Crete, loved it but we inevitably compared it to Kassiopi. Bit of a theme going on here! In an effort to redress the balance we decided to head back to Corfu in September, to Roda in fact. My wife then mentioned we are only about 7 miles from Kassiopi, so I guess we might visit! Whilst we are looking forward to Roda, I have a sneaking suspicion it may be compared. So because of this we have booked two weeks in June at the Dimitrios, no comparison! Oh yes, I like to get my fix with the webcam, looks absolutely stunning as usual. Lots of places to eat in Roda. My favourites are El Mar, Skouna (great food and sea front location) and Roda Park (huge menu and excellent quality). For snacks Yummies is well worth a visit. There are also many bars catering for all tastes. The Boat House (on the edge of the village towards Acharavi) is new this year and is perfectly situated next to the sea, well worth a visit. Old Perithia is too far to walk, but a car hire would solve that problem. Hi all, coming to Roda 26th September for a week , staying at Elizabeth apartments, first time to this resort, wondering what are peoples favourite places to eat and drink are. Not interested in relative cost, just wanting to know which are the favourites, traditional or otherwise. I am especially fond of fish and seafood, favourite dishes being Gavros, Sea Bass, Seafood Spagheti etc. 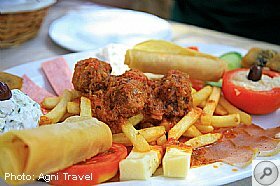 My experience is that generally you cannot go wrong eating out, having stayed in Kassiopi, Avlaki and Kalami many times, eating in these places, also San Stefanos, Porta, Sinies, Agni and others. I would also like to visit Old Perithia if possible, too far to walk or not? Any help appreciated. The Boathouse is the second bar on the way into Roda from Acharavi, the first one is the Brandy Shop. Kalamaki is really easy to get to. Head out of Acharavi towards Kassiopi, past Ice Dream on your left, and the Kalamaki turning on your left is not far after that. It's a pretty steep hill but nothing to worry about. Lovely beach and always fun when the trips arrive there for the beach BBQ's. The Boathouse is a nice walk from Acharavi on the beach towards Roda. t probably takes about 40 minutes if you are strolling, or 5 minutes by car! The Boathouse bar is the first bar as you enter Roda from Acharavi if you walk along the shore. I enjoyed reading your report too. 1 - Which is the best way down to Kalamaki beach? I can see three possible ways each of which seem to fall off the edge of the road! 2 - Where in Roda is the Boathouse bar? Topic: What's The Wasp Situation Like This Year? The last time we visited Corfu was in August '12 and there was a bit of a problem with wasps there. Not sure whether it was just in Agios Gordios or a general problem on the island as a whole. We've holidayed in various Greek islands and resorts over the past 20 years but have never had a problem with wasps. I'd love to book Roda for next summer but if there's a chance the wasps will be back, I'd rather not take the risk. We were told by the owners of Steven's on the Hill, in AG that the wasps aren't normally troublesome until September but they'd arrived early in August that year. Has anybody who holidayed in Corfu this month had a problem with wasps please? View Topic: What's The Wasp Situation Like This Year? posting this little ditty. It was quite difficult this year as our youngest daughter, Seren, has decided to go from crawling to running. No in between, so keeping an eye on her was a challenge! 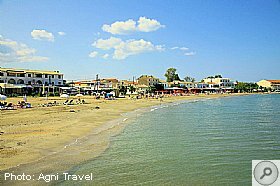 Firstly, we have now been to Corfu every year since 1996 (bar one) and to a certain extent you wonder if it will be your last (will you still find the place interesting, things to do etc), and I can confirm that we left the island with heavy hearts and a feeling that we couldnβt wait for our next visit! We hired a car from the airport as per usual, and so we were able to explore areas of the island (I couldnβt sit by a beach/pool all day). Now my favourite bit of the holiday is always meal times! Three Brothers Astakeria β What a find this place is. All fresh and amazing fish. Very reasonable prices too. Run by twin brothers with their mother cooking. Very small menu, but I would recommend simply taking whatever special dishes they have prepared that day. We had grilled sardines, zucchini, and shark with red wine sauce. It was heaven! and the food and service were top notch. Beautiful setting too. and the food was fantastic. Ordered too much! Was that good we did the Greek night twice! us all. Great views, brilliant food, and efficient service. Faros Acharavi β Great location on the beach and a cracking meze was shared by all. Very friendly hosts too. Woodys Acharavi β Have to admit to being a snob about this place for a few years. However, my wife convinced me to eat here a few years back and I was wrong! Again, really good location, very friendly hosts, and I would recommend the lamb kleftiko. Roda Park β Always a friendly welcome in such a busy place and massive menu. We ordered the fish platter for two which was huge and good value for money. My only small gripe is that itβs that busy you do feel rushed at times. Really nice food though. Gelatis New Perithia β Amazing value, with free pita bread and dip starters, free water and a complimentary ice cream to finish with. We always order lots of starters here, a salad and some chicken souvlaki. The hosts are always welcoming and have time for you. It really is a joy to go back here year on year. And of course we dined at various grill rooms in Acharavi too. Still canβt believe the quality of food you get from these places for such a low price! We also had quite a few croissants and coffees in the bakery over the road from the Adonis. What friendly people they are and we even ordered our daughterβs birthday cake from there which was delicious. A great place to people watch too if you are nosey. As for drinks out, well we always love our time in the Orpheus and Lakis and his family are great hosts. The Adonis was great for an early/late drink. The Mythos bar was very laid back and a very friendly host. But, my find of the holiday and great place to have a chilled out tipple was Jon Banos new bar βthe Boathouseβ in Roda. Heβs obviously spent a lot of time, effort and money on this place and heβs got it just right. Really nice place to just sit back and take in the views of Albania, Acharavi, and St Spyridon and listen to the waves. Also, great to catch up with friends. Claire, Sian, Paul, Rod, Jon, Jo, Lenni, Lakis, Zac, Sid and Jan. Anyway, I wonβt bore you anymore, suffice to say that we will be booking up again for next year, and canβt wait! Anyone tell me if there is any shops that sell 40 or 50 gram pouches of Drum either in Acharavi or Roda as when I was there in June could only get 12.5 or 20 gram pouches and going back in September and would like to stock up. Many thanks. I am going to Roda in September & was wondering current prices of the following if you don't mind. Just an idea would be helpful. Looking forward to it as about 16 years since I was last at Corfu. Thanks guys but don't need to worry about hotels being packed as having a villa with pool and pick car up at airport when we land, first time to Zante and have teenage lads and husband who are looking forward to their little trip to Laganas. Been to Corfu for 15 years and never ventured to Kavos, went to Crete and never ventured to Malia by choice, now they are older have to compromise. Don't like it too quiet we quite enjoy Sidari or Roda and like to drive to the quieter spots in the day. Can't wait, thanks again for replies. Going to Zante Friday. Staying in St Johns Villas, Tsilivi. Anyone stayed there or recently been to Zante? Missing Corfu but having 2 year break as promised ourselves after going for 15 years, went to Rhodes last year and not disappointed. Back to Corfu next year, usually stay Sidari, Roda. How is it out there? Haha, I have a friend that works in Roda too. Oh with a cafΓ© underneath? I know the one. Think we're going to try Arillas, Kassiopi or Roda for our September hol, but you never know, if a ridiculous deal comes up we'll go again! Topic: Is Kassiopi For Us? No we were traveling around for the day, we were staying in Paleo, went to Roda to visit a friend that's working there for the summer. View Topic: Is Kassiopi For Us? Just wanted to let you all know that we stopped off in Kass for a few hours last week on our little scooter, really liked it! Parked up at the end of the big beach. Walked into the village, got a big fat ice cream which we half ate half dribbled on the floor at the harbour then walked the headland back to our bike, had a nice cold beer at a small cafΓ© bar just there on the beach (Had a funky seashell and drift wood covered divider to the loo's) then we headed off to Roda. Thought it was a lovely place and it's at the top of our list for September hols. At the traffic lights going into Roda you take the side road immediately to your right going round past Theordoras and Valentinos. Take a left after Valentinos and go over the the little bridge where the beach will be in front of you. Makis is just there before the one way system on your left. You can park just there at the entrance to the apartments. All depends on where the other holidaymakers are going. We stay in Kassiopi. Last year it was up on side of the island and down the other side Sidari first then Roda then Acharavi then Kassiopi. It took a total of 2 1/4 hours Mind you we did have a face off with a delivery van down a back street/snicket in Acharavi. Not so bad on the return journey just 2 stops and only 1 hour. On the other hand if you are arriving late they may put you in a taxi at no extra cost as they have done with us 3 times in the past. Enjoy. Topic: Temple Of Apollo - Where? It is on the seafront after Big Ben pub and tourist shop before the big hotel Roda Inn on the right hand side heading Acharavi way. View Topic: Temple Of Apollo - Where? Still, where exactly is it? I am willing to risk the disappointment. EDIT: Found it! Somewhere else we got a clue for "Roda Inn''. We did find it once. It is down near the sea. Walk through Roda and towards Acharavi, and it is on the right. When we were there it was fenced off with netting and overgrown but a path goes along one side. Hi Jurjen, now you've got me thinking as well. Like you I've seen the sign at the cross roads, but not seen anything further into Roda. I'll have an ask round when I'm that way again. I'm pretty sure he must do Elliemay, I can't think of another. The next nearest for those interested would be Costa's in Roda. View Topic: Sinies Horse Riding? Topic: Booked. Were On Our Way!!! Well at last we have booked our 10 year anniversary holiday for August...WITHOUT THE KIDS!!! Were off to the Aquis Agios Gordis for a little week. We stayed at the Sandy beach in St George's South last year so if the standard is the same or better than we cant go wrong. Never stayed at Agios Gordis before but from the sounds of things its right up our street. 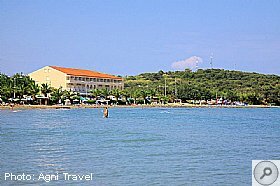 We have spent a few times at Sidari, Kassiopi but I think Roda up to now is why we fell in love with Corfu so hoping Gordis is up there with it. View Topic: Booked. Were On Our Way!!! Want to book 1 bedroom apartment in Sidari or Roda on beach or with sea view, anyone got any suggestions for 2015. Off to Zante this year then back to Corfu after a 3 year break. This page was generated in 6.734 seconds.